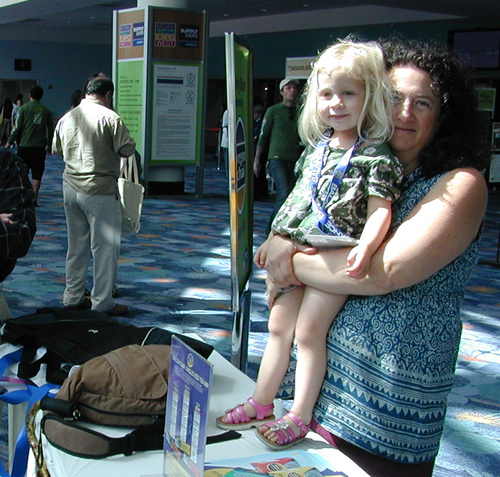 I go to Expo West for my soap business, Tikvah Organics but, for the past several years, Michael and Miriam have joined me and we turn it into a vacation. Miriam charms exhibitors by asking for seconds of foods like pickled herring, I make business contacts and get to stuff myself silly with the latest products, and Michael gets to carry increasingly heavy bags (he has fun too). 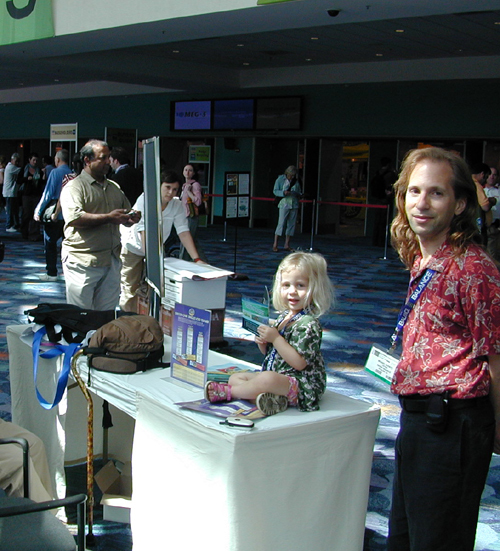 Expo West is held in the Anaheim Convention Center. As disability accommodation goes, it’s not terrible, but of course could be better. The spread out nature of the center, along with few elevators, make wheelchair navigation tedious, and the carpets everywhere don’t help (they are often plusher in the booths, which puts a strain on the shoulders). The air quality is better than many other places, but that isn’t saying much. Last year, they made a huge effects to make the Expo “green” and they advertised lower-VOC carpets, safer cleaning products, and all sorts of stuff. And it really was better. I noticed the difference right away. This year, the bathrooms were cleaned (during show hours!) with nasty stuff and the carpets were the ordinary toxic variety. The biggest problem for me is cigarette smoke. Of course it’s forbidden inside, but people smoke right outside the doors (in droves) so the lobby tends to fill up with smoke due to leakage and people going in and out of the doors. A few signs and some comfortable seating areas for smokers away from the doors would ease that considerably. Driving there is a nightmare. We commuted from LA, which was a 30 to 90 minute drive, depending on traffic (even outside of rush hour). In the morning, the worst of it is in the last 2 blocks. On our first day there, it took us half an hour to go those two blocks, past Disneyland, to the parking lot. Parking is difficult at best (and expensive) but flashing a handicapped dashboard sign was like the key to the magic kingdom. We were ushered in to the main lot where there were plenty of handicapped spots (last year they were hard to get). Note: our friends with handicapped licence plates said that they had trouble getting into the lot because the folks directing traffic didn’t notice them (it’s very crowded and hard to get people’s attention as you get your 2 seconds by the entrance before traffic urges you on). I would gladly get a local hotel and walk, but I’m not sure any of them will be MCS-safe. The show is toxic enough that I have to have a 100% safe place to go afterwards (we stay with a friend). Over the next few weeks/months, I’ll be blogging about what I discovered. I shared some finds at the Los Angeles Foodlab get together and I have many more bags of samples and literature to go through. * Mary’s Gone Crackers now has a thick straight pretzel shape with new flavors. The best part is that, unlike the crackers, they are soy-free. All their products are organic, vegan, and gluten-free. * Coconut juice/water was hot this year, with several booths, including some of the bigger ones that sample in the lobby. My favorite was ONE (which tastes like the real thing) but there are other good ones too. * Gluten-free is also really hot, which isn’t necessarily a good thing. When you depend on a type of product, the last thing you want is for it to become trendy. That’s how you lose it. A couple years ago, the hot thing at Expo West was lowcarb. It had its own section and tasting buffet. By the next year, it was practically gone. * Gluten-intolerance digestive enzymes. I found these at a booth specializing in enzymes. I am not one to be easily impressed by supplement claims, but these folks knew their stuff. The product is designed to reduce symptoms for accidental exposures to gluten. They are clear that celiacs must continue to avoid gluten. For people with non-celiac gluten-intolerance, they say increased ability to consume gluten is a possibility. Stayed tuned for reviews of other products, including cosmetics, personal care, candles, pet food, a trillion food products, fiber/yarn, and more. We thought about going to Disneyland but, at age 3 and quite short for her age, Miriam wouldn’t want to be there more than a couple of hours and couldn’t do much, and it costs like $130 for 2 adults to get day passes (she’d be free). I’d be glad to go next year if we can get free or cheap tickets (only way is to get leftovers from someone with a multiday pass…all the discounts, including AAA and local resident, are for extra days only). And $130 would be a lot to waste since she’s too young. I can’t help myself though — I’m a Disney freak and can’t bear the thought of being so close and just passing it by! lol The last time I was near one of the parks (Disney World) was in 1992 and my son was in 2nd grade and tall for his age, so it wasn’t a concern of mine at the time. I wasn’t even aware of the leftover option! Great to know if the opportunity arises. Of course, airfare, the plane ride itself and a safe place to stay are the biggest problems, aside from being able to handle the park exposures! lol I still hope though! Anyway, it looks like your convention was successful with some real good finds, Cyndi 🙂 Thank you for posting them! It’s buried in my bags of samples and literature on the bed next to the computer. Also, my blog software is broken….took me 2 days to post this entry. I can put in comments at least. Don’t worry, I’ll get to it.